The “EXPERIENCE CAPITALIZATION for Greater Impact in Rural Development” project (2016-2019) is being implemented in different parts of the world by the Technical Centre for Agricultural & Rural Cooperation CTA, in collaboration with FAO and the Inter-American Institute for Cooperation on Agriculture (IICA), with financial support from IFAD. This 3-year knowledge management initiative aims to help improve the analysis, documentation, sharing, and adoption and use of lessons and good practices – as an approach for continuous learning, improvement and scaling up of development interventions. Enhanced information, communications and knowledge management (ICKM) capacity of ACP (the African, Caribbean and Pacific Group of States) organisations that are engaged in national and regional ACP agricultural policy processes and agricultural value chain development. Among others, priorities for this project focus on roll-out and implementation of CTA's new overarching communications strategy, including adoption of an integrated marketing approach to promoting awareness of CTA's regional business plans, new thematic areas and its Strategic Plan 2016–2020. In the field of KM, EXPERIENCE CAPITALIZATION constitutes a significant addition to the portfolio of CTA's KM activities. Support to Data Management will continue through GODAN and more broadly through a number of projects with regional farmers' organisations linked with the Agriconnexions project. To better reflect the expanding interest and documentation of Experience Capitalization in 'KM approaches to support Policy Processes' and 'KM approaches to support Value Chains Development', a CTA's website on Knowledge Management for ARD was established. ... that ensures that practical experiences are captured, and that tangible ‘capital’ is created from them. It is a process through which an experience is identified, validated and documented, leading to identification of and learning of good practices which can then be adapted, improved, adopted by others and up-scaled, leading to a desirable change and a greater impact. ... that helps provide insights that lead to improvement of existing practices in their original context, understand the reasons behind success or failure. It can help provide evidence, supporting advocacy efforts. ... through involvement of different participants. In this case, - the capacities of – and collaborative relationships among – participants are strengthened. Thus, Experience Capitalization is a process by which “an experience” in general or within the context of a specific project or programme is described and analyzed, and from which lessons are identified, shared and used to improve development interventions. ... project (2016-2019) aims to build the capacities of organisations with tools, skills and methods to plan and implement the experience capitalization process in their work [see attached document: Project Brief]. Through its interventions, the project is set to achieve its mission through to ensure long-term sustainability and impact in development. 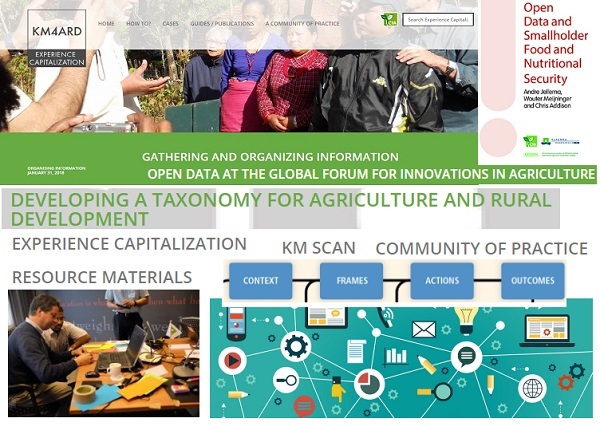 These web pages of the project propose to host Resources, Case studies, Lessons learnt and Good practices related to Experience Capitalization and KM for ARD for the benefit of a wider community of practice. The project is working with rural development initiatives and organizations in Africa, Asia or Latin America & Caribbean, - all of whom are completing a capitalization process – drawing conclusions and presenting and sharing lessons related to a specific project or programme (a “CASE” or an “EXPERIENCE”; see: A series of Capitalization Processes). Building on the previous experiences of all organizations involved, and having a set of training materials as a starting point (see: Guides / Publications), this project not only responds to the need to develop skills but also works to strengthen both intra- and inter-regional partnerships and collaboration. At the same time, this project works to create the necessary conditions so that an experience capitalization process becomes regular practice. It looks at the necessary conditions for continuity (sensitizing key players, encouraging participants, demonstrating benefits) and focus on the need to institutionalize a knowledge management perspective within a development initiative. “Experience Capitalisation involves documenting, capturing, packaging and sharing lessons, something which can take days, months, and even years to happen – especially when working in complex environments”, - from the Interview with Jorge Chavez-Tafur. See more details for Capitalization of Experience Steps HERE. This free FAO Learning Module on EXPERIENCE CAPITALISATION builds on the different experience capitalization efforts that have been tested and implemented by different organizations throughout the world. The examples are meant to help plan and implement a process as a key component of a development programme or project, to ensure greater efficiency and effectiveness. Finding the right and timely information is so hard these days for many people in organisations, especially from huge or unstructured datasets.This especially in ARD where activities greatly rely on knowledge generated from experience. Individuals are seeing the value of structuring and grouping information as it makes it easier for retrieving and using. Proper structuring and organisation of organisational knowledge is key to KM and sharing. A documented taxonomy approach, TAPipedia illustrates a process to developing a taxonomy for Capacity Development (CD) for Agricultural Innovation Systems (AIS). The TAPipedia platform, developed within the context of the Tropical Agricultural Platform (TAP), aims to improve coherence and coordination of CD for AIS. It is therefore, a new TAPipedia taxonomy (linked to AGROVOC thesaurus, on aspects and topics relevant to CD for AIS) designed to serve this purpose. TAPipedia’s participatory approach aims at developing a global reference information system for good CD practices, innovation outputs, success stories and lessons. Here is how the TAPipedia taxonomy has been developed. An interesting method worth exploring ! *** TAKING AN AGRIBUSINESS APPROACH IN THE CARIBBEAN : CTA has recently interviewed Torin Gilalta, technical officer at the Caribbean Agri-business Association (CABA). CABA works to provide a private sector mechanism to facilitate organized, coordinated planning and development of regional programmes and projects in the agri-business sector in CARICOM. With help from CTA, CABA has been able to build an e-commerce platform (www.cabacaribbean.com & www.mycaribbeanshop.com). CABA also has a social media platform (www.talkagri.com) and a programme that certifies basic agricultural skills (www.agri-educate.com). Most recently, CABA has established the Caribbean Agri-business Export Company (CABEXCO). *** KNOWLEDGE SHARING THROUGH SOCIAL MEDIA CREATES A VOICE FOR PACIFIC FARMERS AND SMALLHOLDERS : Interview with Salome Tukuafu, Information Communications Management Officer at the Pacific Community (SPC). "Before the event, Salome conducted capacity building where social reporters were trained on using the storyboard technique and storytelling from the angle of knowledge management... Social media reporters were briefed on conveying the right messages and key contacts to highlight... Hashtags enabled tracking of conversations that highlighted farmer opinions, areas of interest from twitter audiences and also groupings of conversations via related hashtags"